Once upon a time, there was a young knitter (me! ), who had the idea to have a go at knitting socks. This was long before Ravelry, or even t’internet. I understood that a sock was basically a knitted tube, but there was that bendy bit in the middle that made it fit properly; I had no idea how to do that bit. In ‘the olden days’, as my kids call it, you went to your local wool shop and browsed through the pattern folders. Having looked at the sock patterns, I was none the wiser about how to do that bendy bit in the middle. It might as well have been written in Chinese, for all the sense it made to me. Part of the problem was that I didn’t know what the different parts of the bendy bit, the heel, were even called. I like to be able to visualise what I’m going to be doing, but I couldn’t visualise the heel turn because I didn’t understand what it was or how it was constructed. It didn’t help that I’d never come across short rows either. 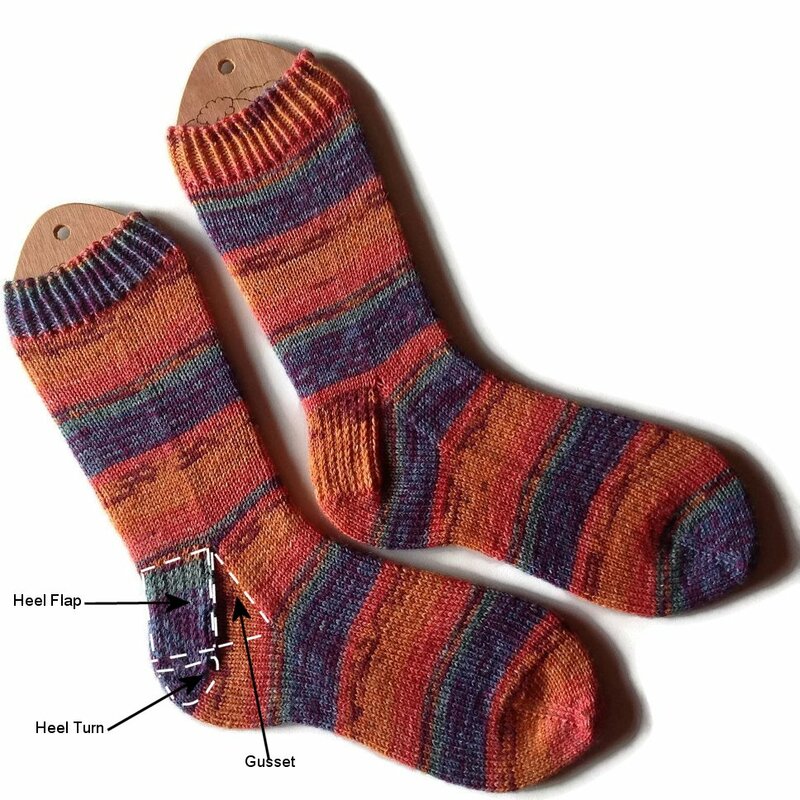 In a traditional sock, there are three parts to the heel. The heel flap: usually constructed from half the stitches and knit backwards and forwards. 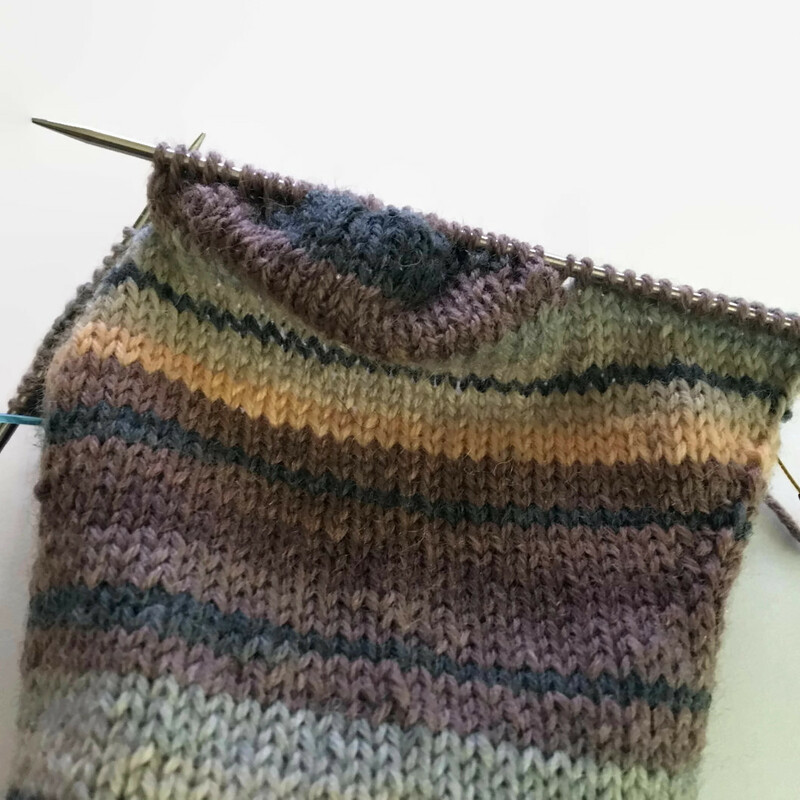 The heel turn: the small section at the bottom of the heel flap that cups the bottom of the heel. The gusset: an extension of the sole that gives extra room, allowing the sock to fit over the instep. The order they are knitted in depends on whether you are knitting the sock from the toe up, or the cuff down. My first few pairs of socks were knitted with the help of Christine Perry’s excellent Sockalong tutorials. A few pairs in, I started exploring toe-up socks, using the Fish Lips Kiss Heel. I really liked the FLK heel, and still use it. It’s quick and simple; after the first one, I had the simple technique memorised, but I do love the look of a traditional heel flap and gusset. Then Nathan Taylor published his Sockmatician’s Toe-Ups. I’d had no idea that such a thing was even possible and couldn’t imagine how it would work. As it turned out, it’s very simple. In my opinion, a toe-up heel flap and gusset sock is much easier than a cuff-down one. One of the things I loathe about a cuff-down sock is the long cast on and either struggling to join without twisting, or knitting a couple of rows, then having to sew up the top. With a toe-up sock, you cast on fewer stitches (usually around 1/3) using Judy’s Magic Cast On, then you start to knit your toe. It’s completely invisible and you don’t have to join anything, you just start knitting. When your pattern tells you to start working the gusset, you start increasing at each side of the sole of your sock. You will end up with a Y-shape, just on the one side of your sock. The point at which you start increasing, and the number of increases you do, can vary from pattern to pattern. This sock is using Sockmatician’s Toe-Ups, and the gusset is usually around 20 rows, with further increasing incorporated into the heel turn. I have knitted a pattern where the gusset started much sooner and there was no increasing in the heel turn. Either way works well , and you will still end up with the same basic shape. Once the gusset is complete, you will work the heel turn. This is the part of the sock that cups the bottom of the heel. From this point on, you will only be working on the sole of your sock. The heel turn is accomplished using short rows. Your pattern will tell you knit across x stitches, then turn. You keep doing this, using shorter and shorter rows. By this stage, your knitting is a very funny shape indeed! 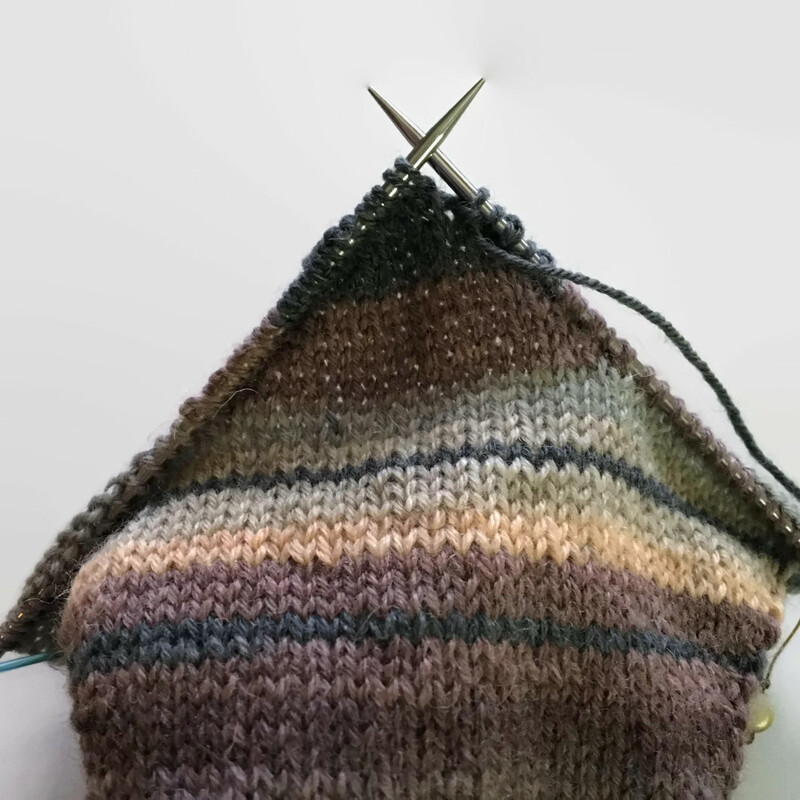 Basically, you now have a triangle (with the tip cut off) at the top of the gusset. 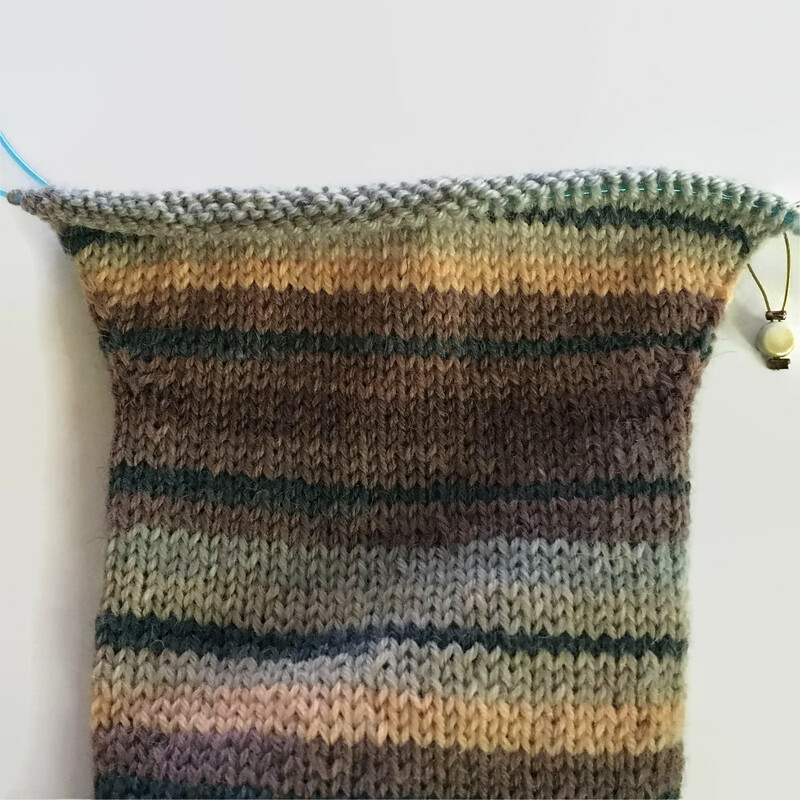 You may even begin to wonder if this oddly shaped piece of knitting is ever going to look like a sock, and start to question if you’ve gone wrong somewhere. This photo shows the very start of the heel flap. The heel flap is worked over the centre stitches, ie, the sole stitches. At the end of every row, you work the last stitch together with a gusset stitch, then turn. You can see the cup shape of the heel turn in the middle. The gusset stitches are on the left-hand needle, and on the far right of the right-hand needle. You work back and forth, incorporating the gusset stitches, until they are all used up. This photo shows the flap about 2/3 complete. You can see the cup shape of the heel turn more clearly, and how what was the top edge of the gusset is becoming the side of the heel flap. 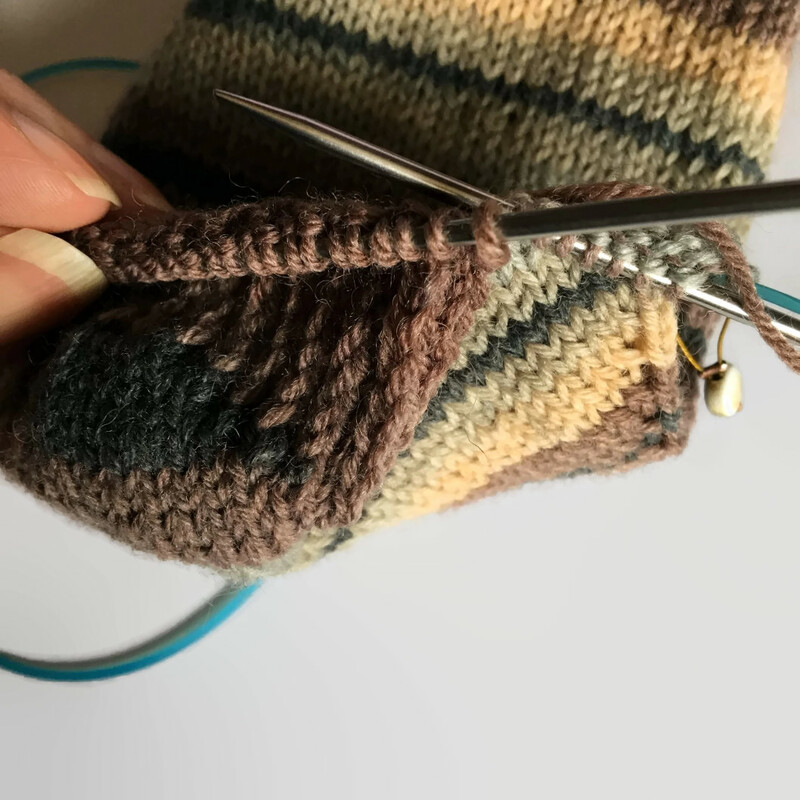 Once the heel flap is complete, you start knitting in rounds again, across all your stitches, and knit up the leg of the sock, adding some ribbing at the top, then cast off. For me, toe-up is the simplest way to knit a sock. A nice short cast on, with no joining; no picking up stitches; no grafting. I hope somebody out there will find this useful. I’ve written about the concepts I struggled with, but we all struggle with different things, so your mileage may vary. Thank you. I’ve only been knitting a few weeks and have made two pair of wonky socks. This is exactly what I’ve been having trouble visualizing. The next pair makes more sense already. Again, thank you.